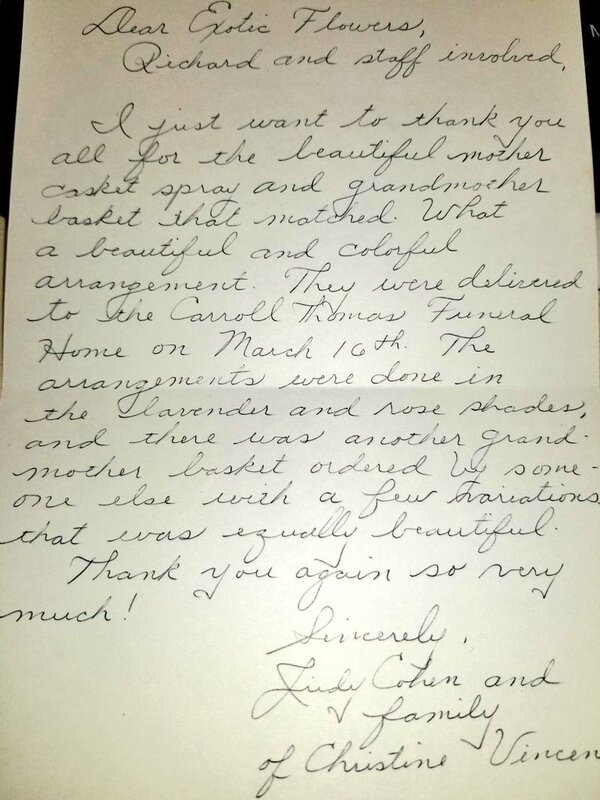 My Mother recently passed away and I was referred to Exotic Flowers by our Funeral Home. My Mom was a very vivacious person and loved color. Exotic made the most beautiful, fall colored, casket spray as well as accompanying arrangements. They were breathtaking and almost every visitor remarked on how beautiful they were. Very different than you would typically see at a wake/funeral. I'm sure Mom loved them. -Adrienne L.
Thank you Rick. She is blown away and they are the talk of the floor at the hospital. Nurses are coming to her room to see them! The centerpieces for Walker’s Lives in Bloom Gala this past Saturday were stunning, and transformed the ballroom into a gorgeous “in Bloom” event. 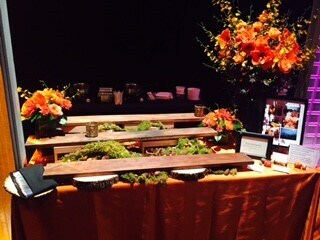 We received so many compliments from guests, and every single centerpiece was taken home! Rick, thank you again for your generous discount. Your support helped to make this event spectacular, and a wonderful success in support of the children and families we serve. Dear Rick, I have been your customer quiet a while and I never underestimated the quality and the style of exotic flowers. You guys always surprising me with the work you do over there. I know many people will say “yeah, you pay the price and you’ll get what you want “, but no, it’s not always like that. My English isn’t that good to express how impressed I am with “exotic flowers” but all I could say is a Big thank you!!! Hello all , Flower arrangement arrived quite nicely, have been sent photos,looks very nice,thank you After holidays and things are back to normal I have several reviews to post on various sites I have used this past few months,yours most certainly will be among them, Thank you for your assistance over the past few years,it has meant a lot. Thank you for the wonderful job. I will be recommending your shop to my friends and family members. Outstanding job! Once again, you have sent a gorgeous bouquet of Flowers to our principal. Can't thank you enough. Thank you so much I appreciate your services the flowers are breathtaking I was told. 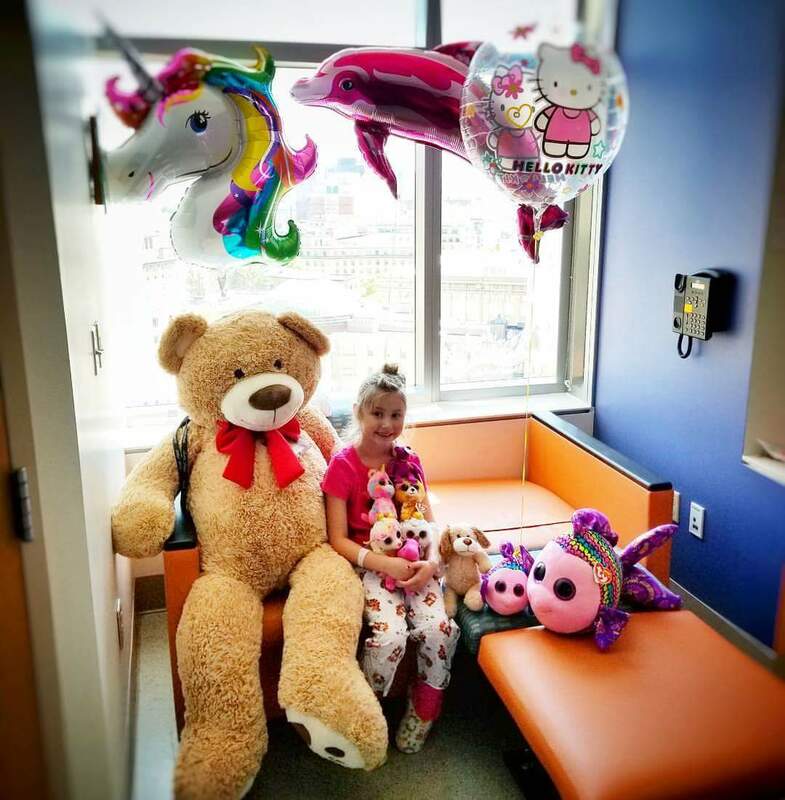 I called your store on Saturday to see if they could deliver a bear to my 7 year old granddaughter who had just had surgery for a ruptured appendix the night before. Of course they were very accommodating and wouldn’t you know we got a glimpse of her first smile post-surgery when that bear arrived on the scene. I thought you would enjoy seeing a picture of Ella yesterday with her new best friend. Looks like she is going home today so all is good. Thank you my mother was thrilled with her birthday flowers and was very impressed with the friendly clean cut delivery person. Heard they were beautiful...thank you so very much for the quick turn around!! Will go online to review your great service! I am attaching a few photos. Thanks for making me look so good, AGAIN! I just want to say what beautiful job you did on the funeral basket. It was gorgeous and we received a lot of compliments. My wife was very PLEASED! I want to thank you for the stunning arrangements for my husband's memorial. They were perfect in everyway. How do I go about keeping the wreath perky? I wanted to take this opportunity to comment on my recent purchase from your establishment. I am very pleased and cannot thank you enough for providing a beautiful arrangement on behalf of a friend who recently died. 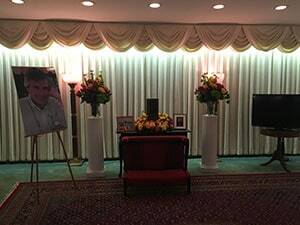 A family member of the deceased sent me a photo of the arrangement as I live in New York and was unable to attend services. Like many people, ordering a flower arrangement of any kind makes a person nervous and one can only hope it turns out well. I am no exception and actually I was nervous about it all. 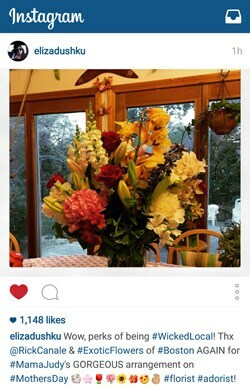 It is not something I would do with regard to ordering flowers for someone who has passed away. I was raised Orthodox Jewish and in that world, flowers at a funeral is not what we do. We bury you quickly and from that point on we put rocks at your grave. Simple and other then sending a fruit basket to the family, we are essentially done with expressing our condolences. Hence, I became even more anxious about this entire ordeal. My friend is of Scottish decent and I wanted to do right by her. Your online website was very easy to use and the confirmation of my order and delivery of same made the experience less stressful. I felt the arrangement was fitting for someone who was a former colleague and friend. That was the goal and your talented staff and business practices made the entire experience worth it all. Thank you again for everything. Your business makes Boston proud. I just wanted to thank you for the arrangement you put together for me. My sister in law is still sending me pictures because some of the flowers are opening now. What a great job guys. Thanks for the timely delivery of the beautiful flowers. My name is Beverly Stepno. Within one week I have received two beautiful flower bouquets from your flower shop. I have sent flowers myself from your store, and I have always been MORE than pleased. I just want to tell you your driver Bobby, who has delivered my two bouquets this week is the nicest delivery person I have ever met. On both occasions he brought the flowers in for me and placed them on a table for me. Opened my cards for me and also brought my papers in from the sidewalk. I mention this because I am on crutches and would not be able to personally take the flowers from him. It's nice to acknowledge and say "Thank You" to someone when they go above and beyond their job and for me that is Bobby. Thank you to the staff at Exotic Flowers for the beautiful corsages and boutonnières for our recent 25th wedding anniversary. Everyone complemented us on the lovely bouquets, etc. 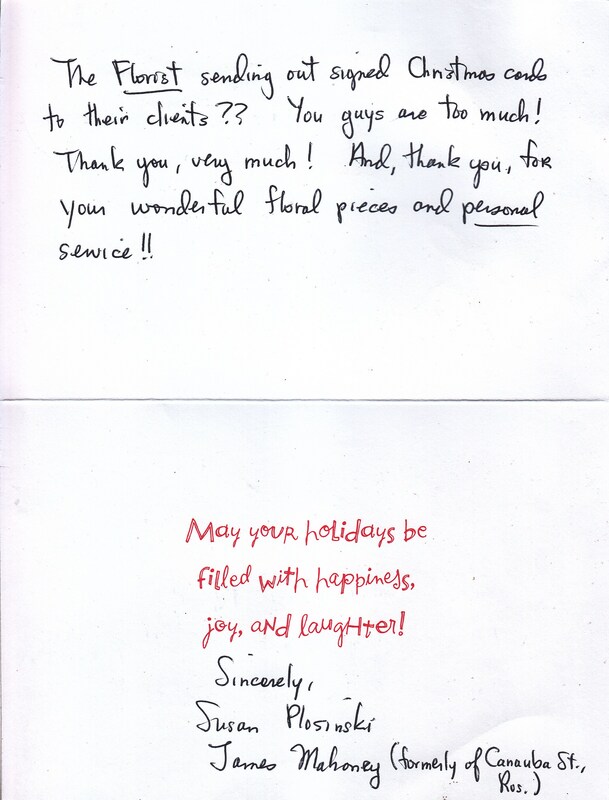 Thank you again for making our day brighter. Another awesome job for last weekend, you're the best! The floral arrangement for Aunt Nancy (Dad's only sister) was absolutely beautiful! Thank you very much! 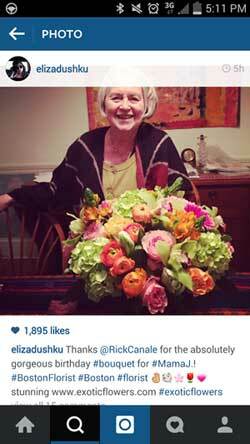 Thank you Rick---the beautiful flowers brightened her! I would like to send a very big thank you to the person who made my beautiful bouquets! Absolutely loved it ... Thank you so very much , you guys awesome! The flowers for my daughter’s wedding Saturday night at the Boston Harbor Hotel were extraordinary. We had many people both on staff at BHH and our friends and family exclaiming about the beauty of Sonny’s arrangements. I cannot thank you enough for the works of art that you made for this celebration. I appreciate the quality of the flowers, which remain in gorgeous shape right now in my house. I also wanted to let you know that Paul Iantosca was a wonderful help in planning the arrangements and interfacing with the lighting designer and our wedding consultant at BHH. I will recommend you to anyone who asks about a florist for events and will hopefully be able to do this a second time for my younger daughter. Many thanks to the staff of Exotic Flowers and especially to Marie and Sonny Canale. Once again the flowers were amazing. Everyone was commenting on how beautiful they were. They really made the room pop. Thank you for the stunning flowers. Well received. After service, flowers were given to Mr. Falla’s nursing home for reception area. Just wanted to let you know the flowers are STUNNING AND PERFECT! Thank you so much for taking care of us for our Birthday girl. The delivery, flower display, and everything was SPOT ON. You have totally taken care of me and reassured my worries on Flower Deliveries, as I mentioned to Shannon how I have had many issues in the past and usually do not do them any longer. I will be referencing you to all of my friends and family, who are ALWAYS looking for 5 star delivery for flowers! Thanks Rick. The recipient said it was the most beautiful bouquet she had ever seen. You guys are the best!! Rick, great job on the flowers! They were outstanding! Thank you, Rick. I want to tell you how breathtaking and beautiful Mary Ann's arrangement was. You always do an excellent job! Many thanks. Your company is TOP NOTCH as we would say at the Pentagon! Thank you for your service with the delivery and a beautiful plant. Will definitely put a posting on Yelp. Thank you for getting the flowers over to mike they are BEAUTIFUL! Mike sent me a picture of them. I have to tell you how pleased Dr. and Mrs Spagnolo were with the magnificent arrangement! They had a wonderful party (the Italien Consulate was there) with so many people commenting on the flowers. Many guests were familiar with Exotic Flowers and I'm sure with all the admiring remarks you will have lots of future business. I appreciate the hard work that went into that artful arrangement. Hi: just a quick note to say the flowers you provided for my booth were, once again, spectacular! The flowers really draw people into our booth. We received so many comments and compliments and my booth personnel, as always, mention Exotic Flowers to anyone who inquires. Oh how I wish you were located in Rhode Island where I live because there is no one I have found locally that quite comes up to your standards. The flowers were there for my mother when they she teamed up from recover waiting on her room on a table for her and her visitors see. They were loved by all as well as many compliments from the nursing, medical staff, as well as other patients and their families. Thank you for doing such an amazing job again! Hi there - I was completely blown away by the flowers I ordered from you. I have never seen an arrangement so beautiful, thank you! Thank you Exotic Flowers for the stunning floral arrangements! As always, creatively designed and the highest quality of flowers! Thanks for doing a lovely job! My daughter and son-in-law were thrilled with the beautiful arrangement. As always you have done a fabulous job, Thank you. You folks are great. Glad I found you....new leaf in JP recommended you when they couldn't do it. So glad they did. 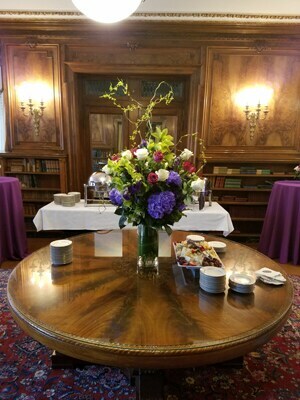 My friend was thrilled with the Beacon Hill arrangement as was I when she sent the picture. Thanks for the personal touch...above and beyond of getting someone to deliver them after the time was passed for that kind of order. A belated note to say thank you for the anchor arrangement you made for the Collins service. It really was spectacular. Very nicely done. The family even gave my mother are few roses back for to take home. She will miss her Aunt dearly. my mom Anna and myself Paula F.
Everyone was raving about the delivery, very nice and thanks! The flowers, as always, were beautiful!! Thank you so much (again) for your amazing delivery. It is because of your beautiful arrangements that make me keep coming back to Exotic Flowers. I saw my parents this week and my moms flowers were great. She really raved about them. My mother’s flowers were beyond STUNNING! My mother actually had tears in her eyes when they arrived on Sunday. Thank you thank you thank you. Recently I needed to order flower arrangements for my fathers funeral. Apparently, most florists aren't open on Mondays in the Dedham/west Roxbury area. So my family went to Exotic flowers. Never doing business with them I was a little apprehensive. From the minute we walked in the service was exceptional. They knew the sensitivity of our visit as we were still mourning the death of my father. Before we left one of the owners gave my mother a a beautiful bouquet of multicolored roses and said "Happy Mother's Day". That random act of kindness went along way for the rest of the day. BTW the arrangements came out beautiful. Better than in the picture. The compliments were incredible. Thank you Exotic Flowers. I want to Thank You. My son's girlfriend was pleasantly surprised!!!! Thank you so much. The roses were spectacular. My proposal for marriage was accepted – the roses contributed to a very romantic evening. Thanks again for the quality of your flowers. Thank you for always providing great service and beautiful arrangements! The flowers were absolutely beautiful. Thanks for much for everything. Stay warm and safe. The recipient took a picture of herself standing by the flowers and texted it to me. She was surprised and pleased. Thank you again for another exceptional delivery. The florist sending out signed Christmas cards to their clients?? You guys are too much! Thank you, very much! And, thank you, for your wonderful floral pieces and personal service!! May your holidays be filled with happiness, joy, and laughter! 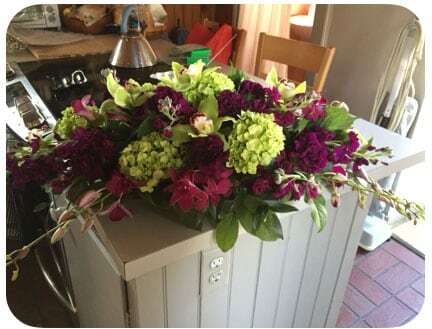 I just wanted to say thank you for this beautiful arrangement – Carol’s family was very impressed and actually told me it was the nicest arrangement there. Thank you for the flowers my friend had been in the hospital and it was a wonderful surprise when she returned to the Rehab she couldn't believe how beautiful they were. My mom just called me and was so happy and surprised by the flowers. She said they were absolutely gorgeous and cheered up the space! Thank you ... so much. It made me feel better to hear her happy. My sister was thrilled with the flowers. She tells me the florist you use in New Bedford is the best one there is in town. She loved the ornament bowl too. Thanks for checking in. My friend sent me a photo of the flowers. They were beautiful and she loved them. Thank you !!! I want you to know that the flowers on the table at the Neighborhood Club were gorgeous! It really couldn't have been any prettier. I have attached a picture for you to see what they looked like. Thank you very much for making Kerri's party turn out so perfect. We look forward to working with you on August 22nd, 2015 for her wedding day! Do we need to sign anything with you to be sure we have you for that date? Let me know. Thank you again and Have a Very Merry Christmas!! Thanks, as always, for your outstanding service. 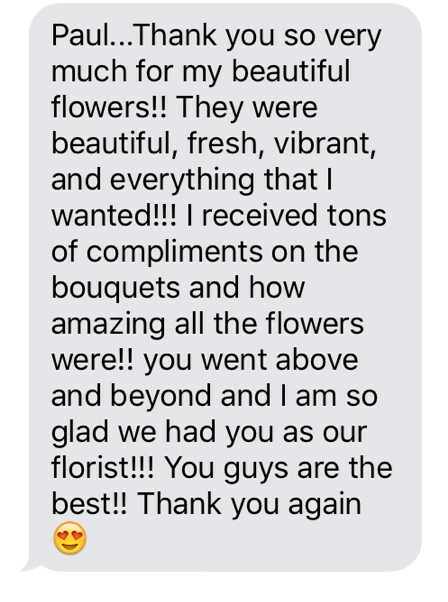 Not only are your flowers truly superior, but the care you give to your clients is second to none... I hope your holidays are filled with peace and joy. 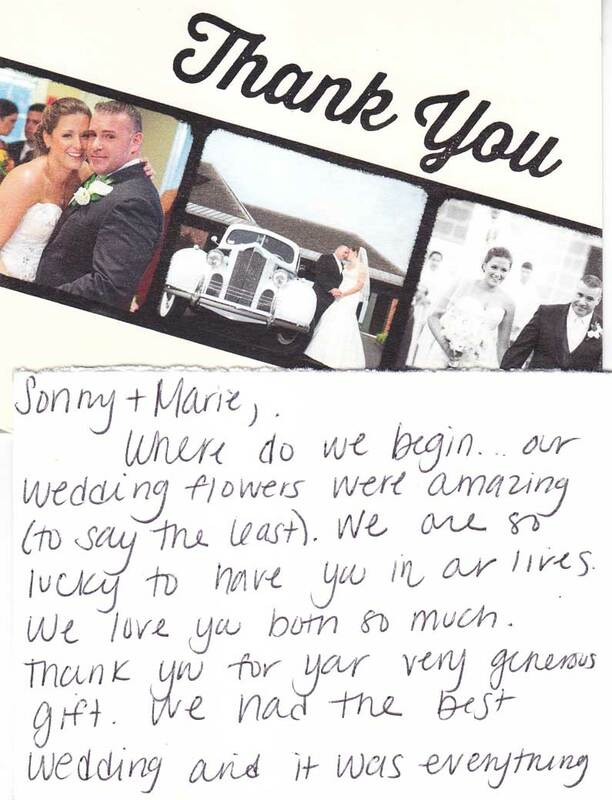 Sonny & Marie, Where do we begin... our wedding flowers were amazing (to say the least)... We had the best wedding and it was everything we could have dreamed of with your help. Received, beautiful, love the delivery guy. I would like to thank you all for your excellent service and the beautiful flowers you picked for my ailing client. Keep up the great work. I just wanted you to know how exquisite the flowers were – many thanks! They arrived and look great - thanks! My parents thought the flowers were beautiful... I very much appreciate it... Below is my mom's text. Dad left me a voice mail and commented on how nice they were. Thank you so much for the flowers and the card. The flowers are absolutely beautiful! Will call tonight. Amazing!! Everything was beautiful!!! Thank you for everything!!! "Thanks for your work on the order. The recipients were very pleased with the flowers." Thank you! Cary loved the flowers. The flowers on Saturday night looked great! Thank you for helping with the last minute ads. 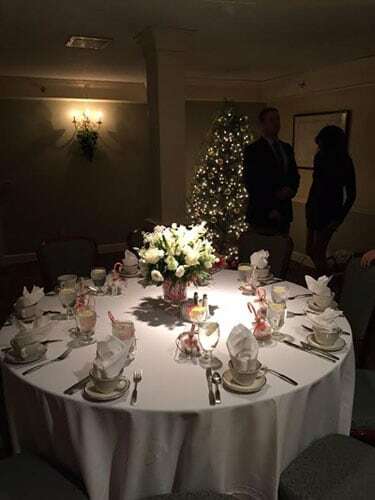 The room looked terrific when I arrived, and our employees were beyond thrilled to take home centerpieces at the end of the party. Thank you for the always quick replies and great service!